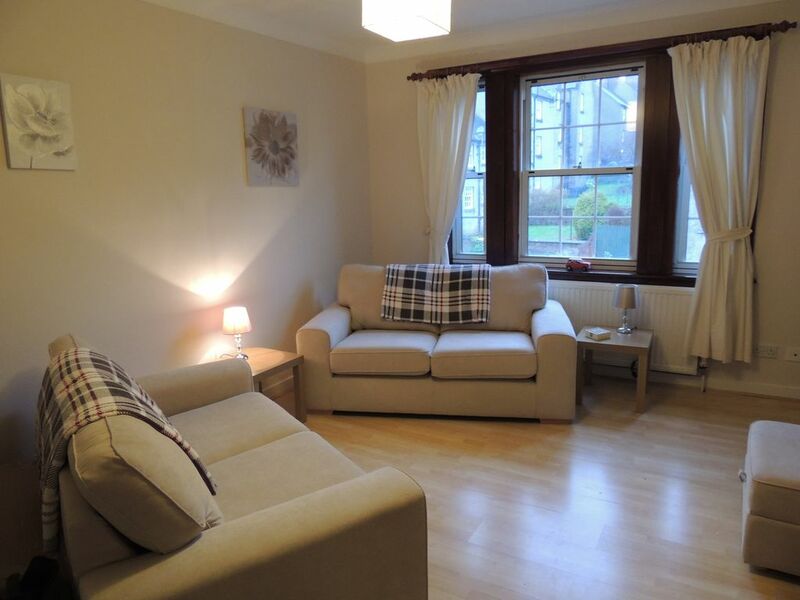 A cosy 2 bedroom apartment in the heart of Stirling. Perfectly situated in a quiet side street between the centre of town and the castle, this welcoming apartment is the perfect base to explore the city and beyond. Internally the lounge comfortably seats everyone for reading, watching TV/DVD and dining. The fully fitted kitchen has views to Stirling’s premier hotels. Two large bedrooms provide kingsize and twin bed options. The apartment would suit families or four adults looking for a safe, convenient base for exploring or a couple seeking a high quality retreat to relax in. We had a great stay at this apartment in Stirling. The location was perfect. The apartment was clean and comfortable. Great place in a great city! Great wifi, kitchen is well equipped, close to all the shops and bus stops. I had a great stay at this property. It is the right combination of comfort and homely. There was good space and light and Daniel provided everything we needed in the flat including a great wifi connection. Included also was the great support he gave during our stay responding quickly to any needs. Added to this is that the location is really central. We walked everywhere from the station to the castle and the city centre. I would definitely stay here again if I come to Stirling. Die Unterkunft war sehr sauber! Es gab unglaublich viel Platz und wir haben uns sehr wohl gewühlt. Die Betreuung war sehr gut! Nur parken ist nicht ganz einfach wegen der zentralen Lage, aber als Frühaufsteher kein Problem. Denn zwischen 17:00 und 08:45 konnte man direkt vor der Wohnung parken! el apartamemto esta genial y muy centrico. aunque para aparcar todo es de pago alrededor. El apartamento estaba muy bien y con todo lo necesario. Lo que no nos gusto es tener que contactar con el propietario nosotros dos días antes para que nos facilitase la dirección exacta. Salimos de nuestro país sin saber siquiera a donde íbamos exactamente. Creemos que una vez efectuado el pago completo, esta información hay que darla inmediatamente.